Want to build a unique model from a plan? Rather than spending hours tracing and cutting out parts before you can even start building, purchasing a Belair Parts Set that includes all the shaped balsa and plywood parts required to build the basic airframe, lets you start building as soon as you roll the plan out. Belair use the latest laser cutting technology to produce Parts Sets from most of the world’s top model designers, including Nick Ziroli, Wendell Hostetler, Don Smith, Jerry Bates, Jim Pepino, Dave Platt, Dan Palmer, Vailly Aviation, Kerry Sterner, Vance Mosher, Meister Scale, David Andersen, TMP, Vintage Glider Co and others. Laser cutting is quite unique in the UK, but has been widely adopted in North America and by almost every ARTF manufacturer. Belair are dedicated kit cutters and are accredited to designers. We do nothing else, but cut kits. Laser cut parts will speed up construction, increase accuracy and make your next project a pleasure to build. The finish on a laser cut part is very smooth and does not require any preparation prior to fitting. Laser cutting does not affect the effectiveness of any glue, so you can continue to use your favorite adhesives with confidence. 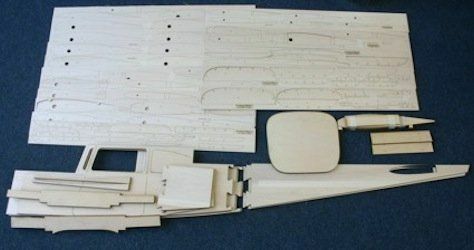 For each designer, we produce Parts Sets that includes all balsa and plywood laser cut parts, typically ribs, bulkheads, formers, outlines, shaped spars and other model specific parts. Just add sheet and strip wood. For ease of assembly, all parts are laser etched with the same part numbers used on the original plan. Please note Parts Sets do not include Plans, these along with accessories such as cowls, canopies will need to be purchased separately. Belair also stock genuine fibreglass accessories, plans and associated parts for most designs. To complement our laser cutting service, we offer A0 continuous length plan printing in full colour, plus an A0 scanner. Using your own CAD data, Belair can also cut parts for your own projects, from one off designs to full production runs. If you would like to get your next project off to a great start, please call us on 01362 668658 and we will be pleased to help.